Making my own seasonings is one of the ways I control my family's sodium and other unwanted ingredients intake. Consider that in 2 teaspoons of McCormick's Taco Seasoning (what is suggested on packet for 2 tacos) there is 380mg of sodium, 1/4 of the my RDA for sodium. Additionally, there is sugar in their taco seasoning. The less hidden/unwanted/unnecessary sugar I consume, the more I can enjoy where I really want it. I don't know about you, but I want to save my sugar consumption for apple pie or chocolate chip cookies! 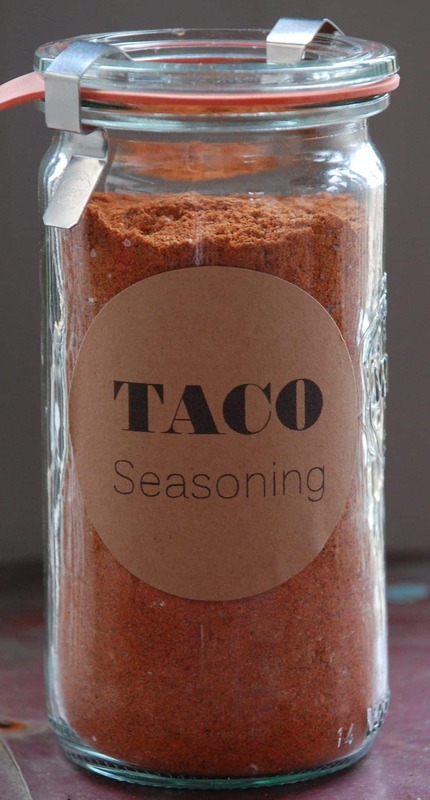 I've tried many taco seasoning recipes and the one we really like is Alton Brown's Taco Seasoning #19. It's different than your standard taco seasoning in that it really has a great smokey flavor from the smoked paprika. The coriander is an interesting addition and I wasn't sure how it's flavor would work with our nachos, but to be honest, I don't taste the coriander at all. This is a perfect example of the theory that ‘the sum is greater than the parts.' The only way I've modified it is that I make 6X the recipe and cut the salt in half. I store it in a glass container and have written the directions for using it on a label on the back. The primary use for this taco seasoning is the Friday Night Nacho, but we use it for tacos and taco bowls as well. When I make a seasoning mix like this taco seasoning, I like to make an amount that will last for several months. In this case, I need 3/4 of a cup of chili powder when I make my large quantity of taco seasoning. This is one of the reasons I like to buy my spices in bulk. I go to my local health food store or order them online from MySpiceSage.com. MySpiceSage.com often has promotions and always offers free shipping.